If you, your child or your loved one plays sports, concussion prevention is critically important. It appears that a growing number of Michigan families and sports fans are all on the same page. Reportedly, University of Michigan Athletic Director Dave Brandon lost his job (he resigned under pressure), not just because of the poor play of the Wolverines on the football field, but also because of the university’s mishandling of the clear on-field concussion of quarterback Shane Morris during a recent game. Concussions are not just a football phenomenon. Ironically, girls are actually more susceptible to dangerous concussions than boys are, particularly in sports that involve both sexes. For girls, the sports with the highest concussion rates are soccer, ice hockey, softball, lacrosse and basketball, as well as cheerleading. Of all of these, soccer has the highest number of American teen players and is therefore overrepresented in concussion statistics. Girls, particularly younger girls, often fail to show symptoms of concussion and take a longer time to heal. Cognitive impairments from girls’ concussions typically last from 10 to 21 days. These impairments cause difficulty concentrating, headaches and memory issues. 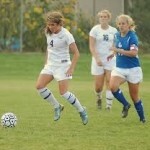 Heading the ball causes many girls’ concussions. Some advocates are encouraging children under 14 not to head the ball. Player collisions contribute to the other concussion incidents. Some leagues have required special helmets and headbands for soccer, but unless an entire league requires it, there can be peer pressure not to wear these protective devices. Second impact syndrome (double impact concussions) are particularly dangerous. These occur when there has been a previous (often undiagnosed) concussion and the child returns to the playing field too quickly and suffers a second brain injury before the first injury has fully healed. 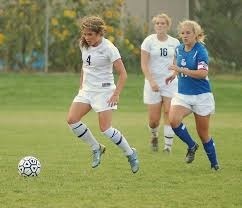 It is possible that moving to a larger soccer ball at age 12 or 13 has inadvertently exposed girls to more concussions. There is a small but growing movement to keep the smaller ball for longer in girls’ leagues. There is also a new Danish ball called the “Eir” ball that is softer and lighter.